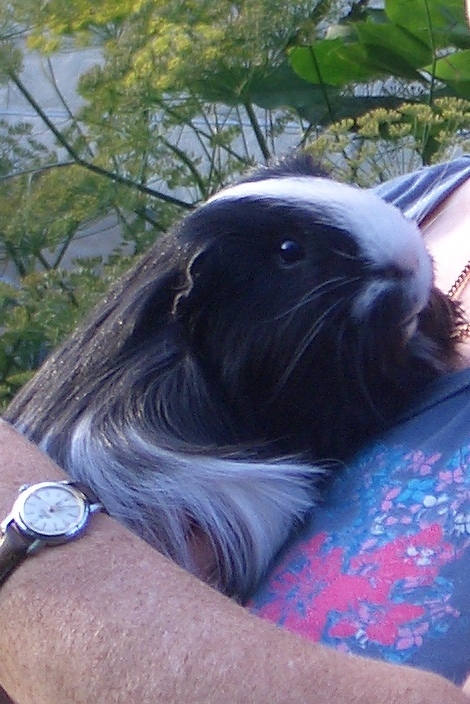 Humphrey went across the Rainbow Bridge on 1st October 2014, a sweet, gentle and brave soul, who asked nothing more than a bite of grass, a warm home, and a kind lap to snuggle in. He came into my life at the start of November 2010, when he’d been in a rescue for a month. He’d come to them a starving, neglected boy, along with a frightened starving three month-old Hector. How old Humphrey was we never really knew. From his size and weight they estimated he was a year or so, six months later I said this to Vedra at CCT when they all had a check-up, and she said “Oh no, he’s at least two and a half; you can tell by the nails.” I’ve looked at nails from both sides now, and I reckon two and a half was conservative even then: Humphrey was at least six, and possibly a lot older, when he succumbed to a tumour which we’d only diagnosed the Thursday before. Humphrey and Hector were best mates for another eighteen months, when I suddenly realised Hector was bullying him. Fortunately, I was ready for a change round of accommodation as the others had been growing up too, and Victor was looking for a nice quiet companion after his role as uncle to the rowdy babes Dylan and Dougall. Humphrey continued to enjoy floor time with Dylan, Dougall and Victor, but would run a mile as soon as Hector appeared. So for the last two and a half years there has been a nice settled morning routine, where Vic, Humph and the Ds would have their floor time, then Humph and Dylan would come up as soon as Hector came along. Humphrey made his first appearance in the books I write about my piggies, when he featured in the Prologue of the third Princelings book. Humphrey got his own story in book 5, The Talent Seekers. The hero, coming to terms with loneliness and isolation, and finding friendship, is pure Humphrey. His photos won Pig Of The Month on the Rodents With Attitude forum on at least two occasions, and he was very grateful and bashful at his award. He bore his illnesses stoically, and kindly, only testing his teeth on my fingers recently, which made me wonder whether he’d lost his sense of smell. He lay on his back again to show off his beautiful toes and tummy for the vet just the day before he died when he had a scan which displayed a huge tumour. I was glad he could have grass time later that day – moving steadily around, and not showing any real discomfort at what had suddenly become a huge growth. The next morning he didn’t want to move much, just be comforted and cuddled as usual. He died peacefully, hiding in his snugglesac, which he’d inherited from Hugo. I’m going to miss my wee man so much, especially with him putting his head over the side to ask for a little more something to go with his breakfast. I’m glad he got a little sunshine on his back on his last day and I know he’ll be enjoying all that lovely grass along with the others over the Rainbow Bridge.